Extra early, extra large blooms are the feature of this award winning sweet pea, 'Mammoth Mix' is an excellent choice for early spring colour and the best strain for producing early cut flowers. The plants are early to flower, heat tolerant and produce well into summer. The vigorous plants have long, strong stems which bear plenty of large fragrant blossoms. The Mammoth Mix contains a selection of stunning shades of crimson, lavender, salmon, deep rose, navy blue, rose pink, and salmon pink, these climbers will be perfect for that first sweet pea bouquet. The Mammoth Series belongs to a type of sweet pea called an 'Early Multiflora Gigantea'. These varieties of sweet pea were developed before the Spencer’s variety and are popular with commercial cut flower growers, as they produce very large and good-quality flowers borne on long stems. The most popular series is the Mammoth Series, which is marked by the longest stems, and a very large flower. This series is also known for great uniformity in the flowering time across different floral colours. If you have never seen this kind of sweet pea on long stems before, and don’t quite understand what all the fuss is all about…they are marvellous … guaranteed to make you fall completely in love with them. Lathyrus odoratus 'Mammoth Mix' is a Fleuroselect Award Winner. Sweet peas seeds can be sown indoors in late autumn to early winter into rootrainers or long thin pots. 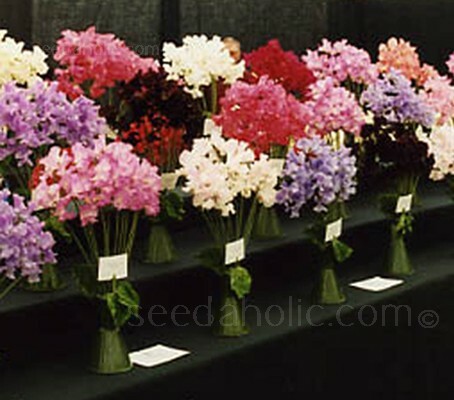 They can also be sown indoors in spring, March to April. Plant out in April to May. Sweet pea seeds can also be sown directly where they are to flower in spring. Flower production is usually around two to three months from planting out. Push two well spaced seeds about 2.5cm (1in) below the compost surface. When roots fill rootrainers, pot on two seedlings into a two litre pot. A temperature of 18 to 20°C (65 to 68F) will give rapid, even germination. As soon as the seedlings have emerged, they need to be grown as cool, and with as much light, as possible. Many places have been suggested as being the home of the original sweet pea stock, among these the Italian island of Sicily, the island of Malta, China and Sri Lanka may be mentioned. One of these places is believed to be the home of the wild sweet pea from which all the cultivated varieties have been produced. Though it is not known exactly in which of these places the sweet pea originated, one historical aspect concerning the sweet pea is agreed on by most people. It is known that Francisco Cupani, recorded the sweet pea as being a new plant in Sicily way back in 1695. Henry Eckford (1823-1905), a nurseryman of Scottish descent, cross-bred and developed the sweet pea, turning it from a rather insignificant, if sweetly scented flower, into the floral sensation of the late Victorian era. Eckford was singularly responsible for bringing out a succession of Grandiflora sweet peas till the last years of the century, these varieties were called Grandiflora, because the flowers on them were noticeably larger than flowers usually seen on the original Cupani variety. His initial success and recognition came while serving as head gardener for the Earl of Radnor, raising new cultivars of pelargoniums and dahlias. In 1870 he went to work for one Dr. Sankey of Sandywell near Gloucester. A member of the Royal Horticultural Society, he was awarded a First Class Certificate (the top award) in 1882 for introducing the sweet pea cultivar 'Bronze Prince', marking the start of association with the flower. In 1888 he set up his development and trial fields for sweet peas in the Shropshire market town of Wem. By 1901, he had introduced a total of 115 cultivars, out of total 264 cultivars grown at the time. Eckford was presented with the Royal Horticultural Society's Victoria Medal of Honour for his work. He died in 1906 but his work was continued, for a time at least, by his son John Eckford. More recently, the association between the sweet pea, the Eckfords and Wem has been highlighted again. In the late 1980s, the Sweet Pea Society of Wem started an annual Sweet Pea show and the town has again taken the flower to its heart. Many of the street signs now carry a sweet pea motif and an area of the town is known as Eckford Park. If you are interested in the growing of sweet peas, why not join “The Eckford Sweet Pea Society of Wem” Named after Henry Eckford. it is dedicated to the conservation and promotion of these varieties. For details, send an s.a.e. to the Membership Secretary, Lyndale Nook Farm, Weston-under-Redcastle, Nr. Shrewsbury, Shropshire, SY4 5LP.